Life is definitely better with chocolate. Fortunately on top of tasting good, chocolate is also good for your body if you eat the better quality stuff. It has loads of antioxidants, plus natural stimulants to give you a healthy energy boost. I like to pop a few squares of dark chocolate in my mouth before a run. During October there’s an extra excuse to go a little chocolate-crazy: one of my favourite food celebrations, Chocolate Week, kicks off on 12th October. But don’t eat just any old chocolate! There are so many people doing creative things with good chocolate, so this month I really encourage you to try something new and interesting. To kick off the month of chocolate, I’m sharing my recipe for the Godiva Chocolate Challenge. 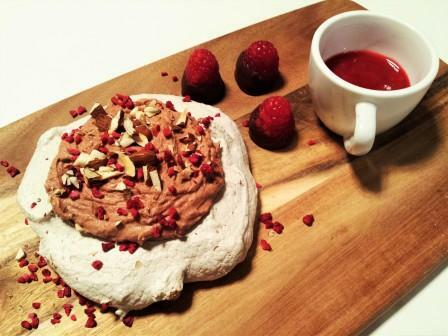 The task was to create a dessert with chocolate, meringue and some pink. The challenge is for the launch of Godiva’s new Mousse Meringue collection, which will have 10% of sales going to the Breast Cancer Now charity. And the winning dessert will be served in one of Mark Hix’s restaurants in London, so fingers crossed. As a proud Australian, my first meringue thought was pavlova. A big fruity, creamy pav was often the star dessert of Aussie picnics when I was growing up. I love the combination of crisp shell and chewy centre, with a big dollop of cream on top. I took inspiration for the basic meringue from my trusty Australian Women’s Weekly The Complete Book of Cupcakes and Baking. I adapted this with some meringue mixture additions and toppings. 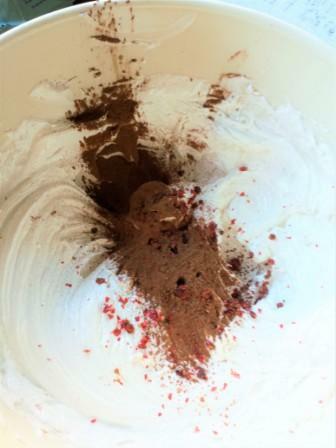 The surprise ingredient is pink peppercorns in the meringue; it adds a warming spiciness. I also thought mini pavlova form would be a bit easier to manage rather than trying to cut slices of a large one. The other pink element of the dessert is raspberries. To make the most of their flavour, I recommend using a dark chocolate with raspberry tones, particularly for the dipped fruit. I used Paul A Young’s 64% Madagascar baking beans, but any other red fruity Madagascan chocolate should be good. I love the sweet tartness of raspberries with the mild bitterness of the chocolate. This is definitely not an ‘eat every day’ dish, but if you fancy something a little special – and a little chocolatey – then go for it. 1. Preheat your oven to 100°C (fan). Line a baking tray with baking parchment and trace 4 x 12cm circles on the paper. 2. In a clean bowl, beat the egg whites with an electric whisk until they form a soft peak. Gradually add in the sugar, beating after each addition until the sugar dissolves. 3. Sift over the raw cacao and add pink peppercorns. Fold into the egg white mixture. 4. Spoon the egg mixture on to the baking parchment circles and spread lightly. Indent the centre of each circle with the back of a spoon. Put in the oven for 1 hr, and then turn off the oven and leave the pavlovas to cool with the oven door open. 5. While the meringues are cooling make the raspberry sauce. Put all the sauce ingredients in a small saucepan over a medium heat. Simmer gently for 5 minutes. Pour and press the sauce through a sieve into a bowl and leave to cool. 6. For the chocolate raspberries, put the melted chocolate in a small bowl. 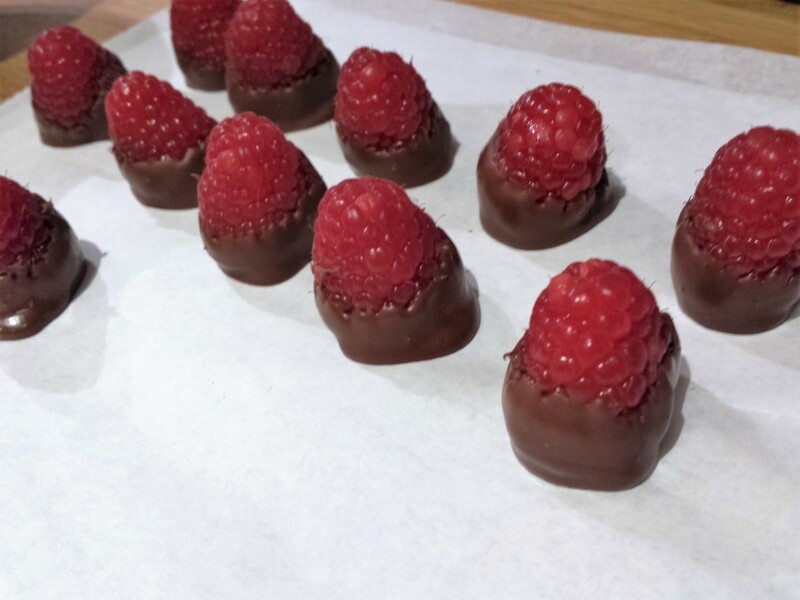 Dip the base of each raspberry in the chocolate. Place the raspberry on a piece of greaseproof paper to set. 7. Once the meringues are cool, prepare the chocolate cream. Whip the cream until soft. In a separate bowl, mix the melted chocolate and rosewater together, and fold in 1/3 of the cream. Now fold the chocolate mix into the remainder of the whipped cream. 8. To assemble the mini-pavlovas, put each pavlova on a separate plate and scoop some chocolate cream on top. 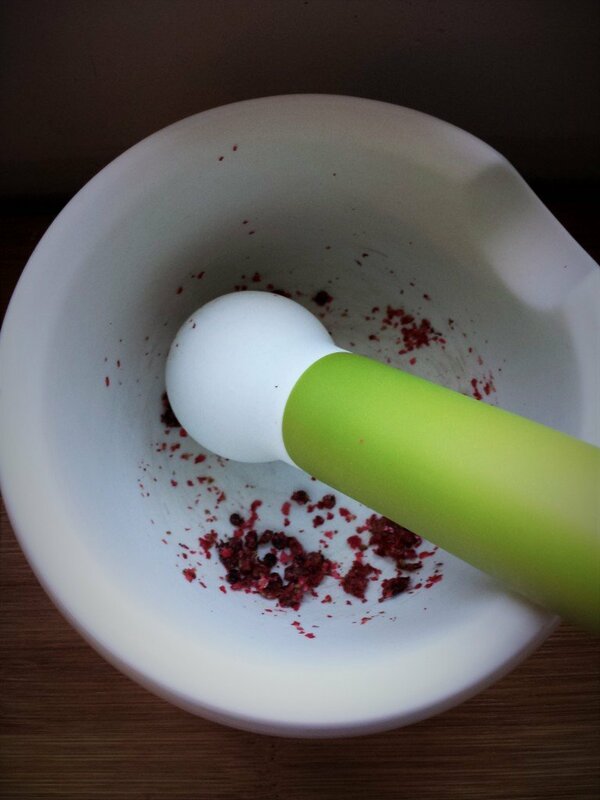 Sprinkle over almonds and freeze-dried raspberries. Divide the raspberry sauce into 4 espresso cups. 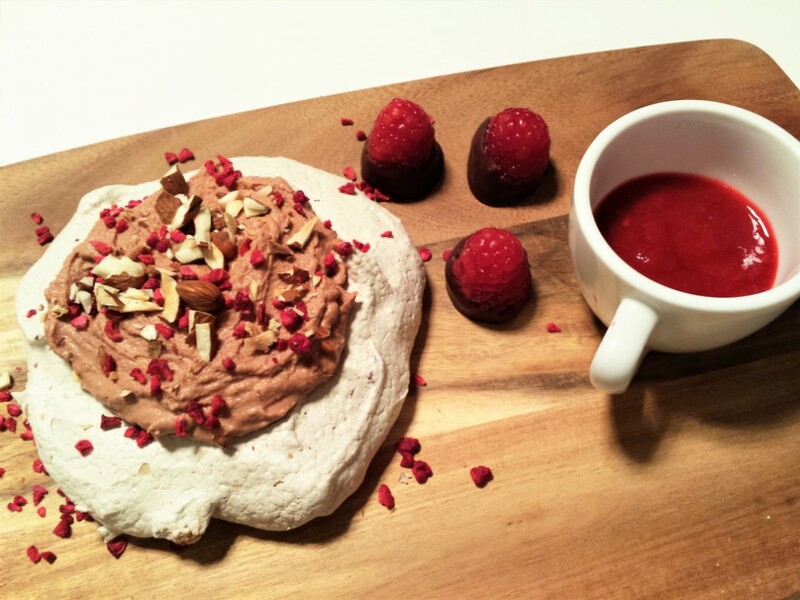 Place each cup next to a pavlova on a plate, along with 3 chocolate-dipped raspberries on the side. Find out more about Breast Cancer Now.